Dr Sarah Hunt – begins at 33:30 min mark. Truth Before Reconciliation, Pt 2 Recorded live on Friday, March 10, 2017 from Unceded Coast Salish Territory / Vancouver. While much academic and public discourse since the release of the Truth and Reconciliation (TRC) final report has and continues to emphasize reconciliation, there is also deep skepticism about a process of reconciling that so readily glosses over truth-telling. Centering the truth as it relates to the TRC is essential to any meaningful process of reconciliation in Canada. On today’s show we feature the powerful talk by Dr. Sarah Hunt at a Forum held by the Simon Fraser Institute for the Humanities – March 10th. Sarah Hunt joined First Nations and Indigenous Studies and the Department of Geography in July 2015 as Assistant Professor of Critical Indigenous Geographies. 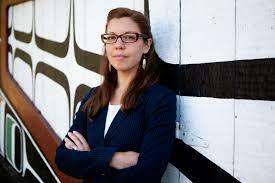 She is Kwagiulth (Kwakwaka’wakw) from Tsaxis, and has spent most of her life as a guest in Lkwungen territories. Sarah’s scholarship in Indigenous and legal geographies critically takes up questions of justice, gender, self-determination, and the spatiality of Indigenous law. Her writing and research emerge within the networks of community relations that have fostered her analysis as a community-based researcher, with a particular focus on issues facing women, girls, and Two-Spirit people. Also on today’s show – International Day Against Racism: Significance for Labour at 21:30 min mark; and March against Racism Sunday March 26 1 pm Thornton Park. Plus news, weather, and more.